Yes! 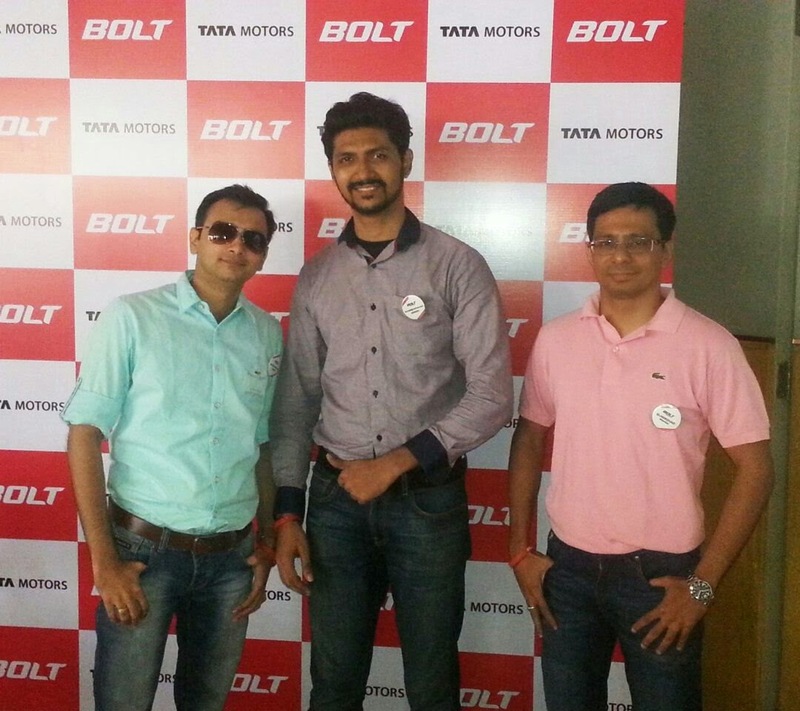 Excited as a word is just a tip of an iceberg, when it came to the excitement levels on 19th April, 2015, where I was about to get my hands on the new Tata Bolt. Captain Asleep: Is there a Tomatino festival here? Captain Bolt: No, you idiot, wake up! It is me, Tata Bolt. Wait! Stop staring at me as if I am your wife! The venue, Cafe Infinito, at BKC was full of excited bloggers, chirping, laughing, clicking selfies and doing what people usually on a Sunday morning do, relaxing. I noticed that I was in for some special treat, as I walked towards my table, directed by none other than ‘the most energetic smile I’ve ever seen on a Sunday morning that too at 8 am’. Don’t ask who. She knows it! Captain Asleep: Wondering, how can one be so pumped up on an early Sunday morning? I met my fellow team mates, Vishal and Monish pretty soon and we got started with the introductions after having an excellent breakfast. It is from the introductions, that all the fun began. Having asked to introduce ourselves creatively, Vishal came up with a unique idea of introducing us through dumb charades. Captain Stage Phobia: Thank God, Vishal agreed to introduce us! Else, I would have definitely grabbed ‘The Most Lame Introductions Ever’ Award at WIN’ 15. We finished the introductions in a grand style with (if I am not wrong) one of the best introductions ever, as majority of the bloggers out there had a fun time guessing what Vishal was prompting. After the introductions, we were being presented with a presentation about the details of the car, the design and almost everything that can be put up, in say 30 minutes. Almost, all the bloggers managed to keep their eyes open all the while. Captain Asleep: They had to as nobody wants a ‘Sunday Morning Sleepy Face’ to be clicked and uploaded. After a much needed short break, the bloggers were fresh and ready to hit the roads on the new Tata Bolt, for which, we were divided into 8 teams, four driving the petrol variant first and four driving the diesel variant first. Ours was team D3, meaning we had to drive a diesel variant of the new Tata Bolt and Vishal, being generous enough allowed me to drive first. Captain Now Awake: Thank you Monish for declaring about your driving skills to us. (Else, tightens the fists and stares…) I truly like you for that! After waiting for almost 20 minutes for the rest of the A, B and C teams to flag off their drives towards Lonavala, finally it was our turn to set out on a wonderful and memorable journey in the new Tata Bolt. Let me at the outset make it clear that my opinion of the car will be that of a ‘user’ and not technical. The exterior was pretty good. I liked the design and the bright red color. It probably went in sync with the exterior. The interior was plush and made me feel like I am seating in a premium hatchback. With full of excitement, I pressed the accelerator and off we went for our first test at MMRDA grounds. It was a suspension test, where I drove two circles and tested the suspension on the speed breaker twice. The first time, I took it at a dismal speed and we all felt as if we were at the Essel World, enjoying a dangerous ride. However, for the second round, I kept the speed slightly above the previous time and off we went, feeling only slightly uncomfortable. This shows that you need to be at some speed to avoid the bumpiness and the car has a good suspension to take on the bumpy ride. In the meantime, Captain Bolt from the infotainment system interrupted us in a nice way by introducing himself and promised to be back soon. After that, it was a ride not to be forgotten for a long long time especially for me, as I was driving long distance, if you may say so, for the very first time. I felt the car to be extremely responsive and the pick up was excellent which you would not find in many of the top selling cars in the segment. As we drove, Vishal, tried many functions on the Harman infotaiment system with touchscreen and I tested the voice command system of the car. The buttons are responsive with a single touch and to make the drive comfortable, the voice control buttons are mounted on the steering itself. Thus, making it easy to command any instructions, like increasing the temperature, setting an FM or even dialing a call and reading an sms. The most thrilling part of the ride came when we hit the highway and more so the Mumbai-Pune expressway where I touched a speed of 140 kms not once, but four times. The interesting part is that the car didn’t even shake at that speed, where most cars almost give up and the steering and dashboard gives you a feeling that it is shaking. I could simply zip zap my way through the minimum traffic that Sunday morning had and that is when the funny Captain Bolt called. Captain Bolt: 140 ki speed pe toh maze he honge na!??!! It was then time for pit stop at the Food Mall where Vishal took over for the rest of the drive as I sat like a happy and proud puppy having beaten the blues of driving at some speed. Captain Not So Cool: Try driving at that speed or even at half of it with your family on board. I’m sure with all the avoidable, incessant and continuous round of instructions you will prefer to bang your head on the steering wheel, like Bang Bang!! Captain Delighted: You talking to me…. ? After a chilled ride with temperature set to 18, we reached for our next pit stop for lunch at Triose Plaza. Feeling famished after driving for most part of the journey, I along with the blogger friends took to having the delicious lunch. I gobbled up as much as my stomach could allow me. We continued with our ride but only after exchanging the diesel variant which I had driven, with the petrol Revetron variant. Vishal was game to drive through the ghats towards Tiger point, the final destination and well, he literally made the insides of my stomach churn in agony as he swirled the car at some speed. By speed I mean not less than 35 to 40 kms where there are steep turns to handle. And the petrol variant was pretty much responsive with sudden brakes and turning smoothly at some speed. All the while I was seated at the back seat and my ride was pretty smooth. The best part about the car is its leg space; the best among all the hatchbacks as it will be evident from the video. Upon reaching the Tiger point, it was a mandatory selfie and photography sessions. Post which we drove back to base with a halt at CCD. Captain Tired: Yawns and tries to catch some sleep. What! Who! I’ve won the photography contest. Whoa! That’s precisely what one needs after an exhilarating day, right? Flexing arms with a wide smile on the face. Overall, if had to recommend the car, then I would definitely recommend it. 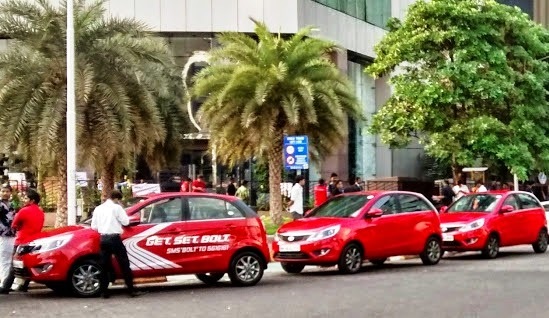 BOLT from Tata Motors is not to be missed if you are planning to buy a car anytime soon. Last but not the least, I would like to thank the Team @ Blogadda and Tata Motors for organizing such a wonderful, coordinated and hazzle free drive and giving me an opportunity to test drive the new Tata BOLT. Cheers! !